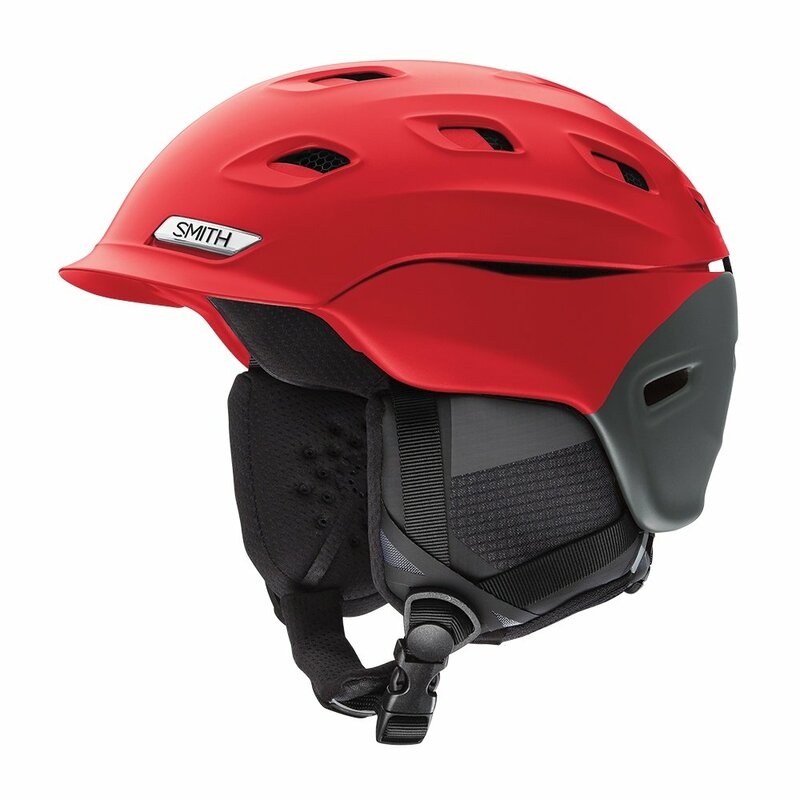 Helmets used to feel like you were wearing styrofoam coolers on your head, but the Smith Vantage Snow Helmet makes use of the latest technology to improve fit, performance, and above all comfort. The FS360 Boa® system uses a dial at the back to adjust the fit all around the helmet, providing better protection while giving you a better feeling on your head. The Aerocore™ construction uses signature Koroyd® tubing, which looks kind of like a honeycomb, to reduce weight and improve ventilation, without compromising protection. That means when you open up the dual regulator all the way on warm spring days, you'll get more air flowing through the helmet, and out of your goggles too, thanks to AirEvac 2 Vents at the front. I used this helmet for 26 days at Loon this past season. Loved almost everything. The only con is the Boa. I have boots with double boas and am a big fan. They just used the wrong Boa ratchet wheel. The issue with this one is that the wheel does not lock in place once you set the desired tension. If you have a collar instead of a hood, when you turn your head the collar makes the Boa turn, loosening it. Maybe this is not an issue for a skier. But for riding you turn your head way too much for this. If they just used a pop lock it would be 6 stars. I had 2 other rpeople notice my helmet who were wearing the same one and both asked me if the wheel spinning on the collar was an issue. This leads me to believe I am not the only one. Can't believe this was not seen during product testing. Had the Smith helmet for about two or three seasons, used quite heavily in Chamonix & Courmayuer along with ski touring trips in Canada. Looks great and offers superior ventilation. Was a great helmet for the first season but after significant use, it eventually succumbed to the daily wear and tear and literally fell apart. The helmet is made up of a few shell pieces unlike other premium brands which are one large hard outer shell, so after a lot of general use, the pieces eventually separated. For a premium helmet, seemed cheap, though the style was what drew me in initially. For the average skier, helmet is probably great, but anyone taking it on longer trips/excursions/ski touring or using for a lot of ski days each season etc, I'd recommend looking elsewhere. I have used this helmet for several years, and been very pleased with it's comfort and style. After this years Easter I can add a first hand review of quality as well! I had an accident while skiing that resulted in me hitting a cliff with left side of the head and the left shoulder. Some broken bones and pain.... However looking at the helmet I can testify to the most important aspect: It's ability to save your life! My skull would be completely crushed above the left ear if not for the helmet. Now all iÃ� have to do is heal some bones and buy a new Vantage helmet and go on with skiing and the rest of my life. This helmet is my go to. It is warm in the middle of winter yet with the vents it is still comfortable and breaths well during warmer spring conditions. I love this helmet and completely recommend it to anyone. e a helmet should,not to tight but not lose like a bell .This is my 2nd one. I tried another brand , GAPER fit.So I'm back !!! This product is designed well, fits great and has multiple options to vent and tighten on the head. you can't go wrong with this. I previously owned a Boeri helmet as it was the only brand that fit comfortably. I've always had a difficult time finding a helmet that fit comfortably. I finally found the Smith Vantage had the comfort level, fit and ventilations that I was happy with. The fit was comfortable and not too heavy. On cold days it was plenty warm and the adjustable venting kept it from being too hot on warm days. Awesome helmet. Easy to open vents, intuitive goggle and chin straps, and size adjustments are great. Far better then the anon helmets I have owned in the past. Love it. I like this helmet. Worked well for a full season of ski guiding here in the Wasatch. I removed the earpieces and have room to wear a thin hat under the helmet. I find the fit can be a bit big on Smith helmets so the addition of the boa closure allows you to snug it down over a layer. Goggle attachment also works well for keeping goggles up on the helmet when wearing sunglasses. The design and look is great. Then you get it backed by functionality. Got this years blue colour. Helmet fits ok, went for L when usually M, quality is just ok for price but paint started to come off the upper piece from day 1, now it looks years old. This helmet fits great. The boa system dials it in. Nice and warm when it's chilly and open up the vents when it's warmer. Had been putting a new helmet off for a while, and man this was a great upgrade. This is a great helmet. It is lightweight and comfortable enough to wear all day. The air vents provide good ventilation when you need it and when closed the liner provides a enough warmth when it gets chilly. The padding on the chin strap helps prevent irritation and keeps the helmet in place. I highly recommend this helmet to anyone looking for a high quality piece of headgear. Excellent Product! Your brain thanks you! I have been harped on for years to wear a helmet by friends and family (I hit upper 50+mph on a regular basis when carving and have topped at 71mph). And as a certified Profession Ski Instructor of America I need to also set good examples for the kids I teach, who all wear helmets and would ask where mine was. So I got one for Christmas a few years ago (different brand) and tried it out but it did not feel like it was a part of me, so it stayed in the closet since... Flash forward to this year - I tried on a friend's Smith Vantage Helmet and it was like I heard angels sing from the heavens and a golden circle of light was emanating from my head!! I found a helmet that feels like it was made for me and doesn't make me feel like a bobble-head!! The adjustable Boa system around the head makes for a tailored fit that feels incredible, with or without a hat on under the helmet (I normally ride without it). I also have the Smith IOX Goggles and they seamlessly integrate with the helmet as well, reducing "gorby gap." I have never had a helmet that I would rave about to this extent and have not gone a single day since its purchase without wearing it! If you're looking for a helmet to protect your head - LOOK NO FARTHER!! Your only regret would be not getting this! Great helmet! As a person with a huge dome - I'm always nervous to by a helmet without trying it on first. Took the risk and ordered an XL online. It fit perfectly. Super comfortable and surprisingly warm. Not bad but you you can't hear much, and it's hot. This helmet fits my head great. All smith helmets fit my head really well. My biggest complaint is that the helmet ear pads are so flush against your ears that it's like putting your hands over your ears. It really makes it hard to hear. My second beef is that the helmet doesn't vent well. the first day I wore this helmet, it was snowing probably around 28° F, and the helmet was roasting. The Koroyd material doesn't let air move through it very well, and I had to constantly take the helmet off. I generally wear a size Medium in helmets, and this Medium size fit well. This helmet fits my head great. All smith helmets fit my head really well. My biggest complaint is that the helmet ear pads are so flush against your ears that it's like putting your hands over your ears. It really makes it hard to hear. My second beef is that the helmet doesn't vent well. the first day I wore this helmet, it was snowing probably around 28degrees F, and the helmet was roasting. The Koroyd material doesn't let air move through it very well, and I had to constantly take the helmet off. I generally wear a size Medium in helmets, and this Medium size fit well.